You probably already know we talk about music coming into the city and music coming out of our city – but today we are focusing about music coming out of the city. Each Thursday morning on Radio Milwaukee, the Journal Sentinel’s Piet Levy and 88Nine’s Jordan Lee talk about the music coming into Milwaukee and the music coming out of Milwaukee on Tap’d In. Today we’re focusing on the music coming out of our city. Read more and listen to the podcast episode below for more on a few special events featuring local artist this weekend. Locate Your Lips was a pop-rock band in the 80’s very much inspired by The Clash. 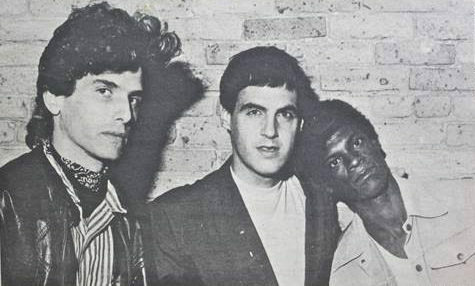 Kenny Baldwin was in that group and is still very beloved in the Milwaukee music scene. He passed away in 2015. Studio sessions were unearthed and this Saturday at Shank Hall will be a listening session of those recordings in a club setting with a mingling of old friends, but you don’t have to know anybody to appreciate this music. It’s really good! It’s a shame it was lost for years, but how wonderful it is being released now. I’ve listened to “Music Box Dancer” and it’s a much more polished effort, but maintains her great vocals and songwriting. The year is extremely young but I wouldn’t be surprised if it’s on a lot of year end lists in the local scene. With Hi-Fi Café being her home base, it’s become the home base of the sound and the whole Music Box Dancer movement has started and sprawled out. It’s exciting to see her take her show on the road.